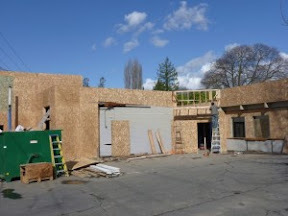 My Wallingford has had its sight set on Bamboo Village since Po Lee, the former owner of House of Hong, began the build-out on a new Chinese restaurant near Green Lake. Though the opening date slipped a bit (no news to anyone familiar with the city permitting process), Lee announced his daily dim-summery will open for dinner Saturday after a private grand-opening celebration — complete with lion dancers. I took a spin by last night to see how the place was doing in the days leading up to its debut. Looking good! Bamboo Village, at 4900 Stone Way North, “before” in March and “after” [taken last night]. If you were standing in the parking lot at Bamboo Village with your back to the entrance, as I was last night, you’d be looking at Kidd Valley and Perche No Pasta & Vino, just off that annoying umpteen-way stop at Green Lake Way North and North 50th, where the light takes forever to get you going in the right direction. Pasta? Vino? Burgers? Dim sum? Coming and going, they’ve got you cornered. If all goes as planned, beginning Sunday, Bamboo Village’s hours will be 10:30 a.m. to 9 p.m. Sundays-Thursdays and 10:30 a.m. to 10 p.m. Fridays-Saturdays, with dim sum-cart service till 2 p.m., and off-the-menu dim sum available thereafter. See you there!